This new eatery in Poznań, Poland sports an unconventional interior that’s all about imaginative upcycling. 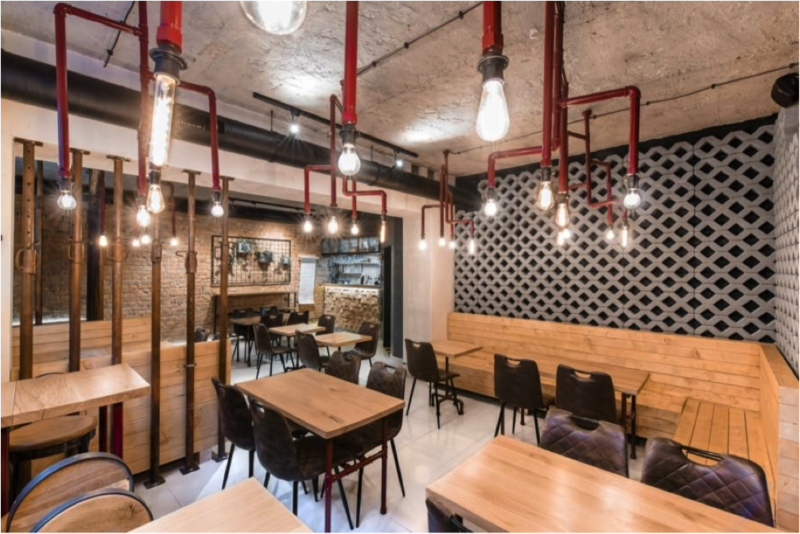 Polish architectural interior design studio mode:lina outfitted the restaurant — called The Rusztowanie Grill and Bistro — with a suite of construction materials repurposed into decor, serving plates, lighting fixtures and more. Serving up comfort food like massive burgers and hearty soups, the eatery’s contemporary and industrial-chic design matches its Instagrammable food offerings. Located in Łazarz (St. Lazarus District), one of the oldest districts in Poznań, Rusztowanie Grill and Bistro can be found in the basement of a historic townhouse that dates back more than 100 years. The space spans 538 square feet and was designed with products sourced from a building warehouse. The existing exposed brick walls were retained and, matched with the Edison bulbs, track lighting and exposed concrete ceiling, they give the space an industrial feel that’s emphasized in the decor. Timber sourced from the warehouse forms the bar front and booth seating. The timbers were deliberately misaligned to bring attention to their raw appearance. 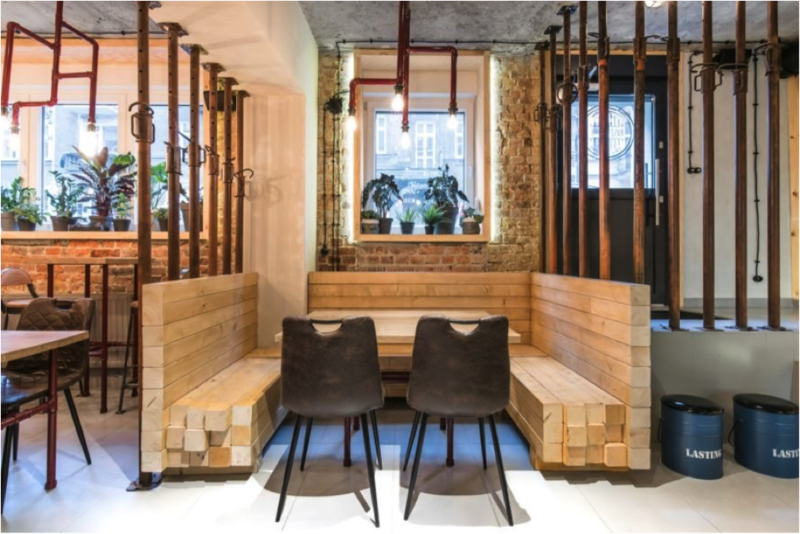 Galvanized metal pipes were reworked into sculptural lamps, table legs and wall partitions. Concrete lattice paving blocks were stacked in front of some of the exposed brick walls that are painted black. The burgers are even served on a shovel head repurposed as a plate.